Dropcase Games, the earliest coin-operated payout machines with the simplest mechanism, used the coin as projectile and its potential energy due to gravity as motive force. Pins randomised the fall towards win, lose or return receptacles. Coins were either dropped from the top, shunted by lever or hand from the side, or fired upwards with a sprung trigger. First they paid cigars, tokens or tickets; more generous payouts and jackpots were offered by later versions. Self-proclaimed 'games of skill', players were required to aim the coin. What occurred next was up for debate. 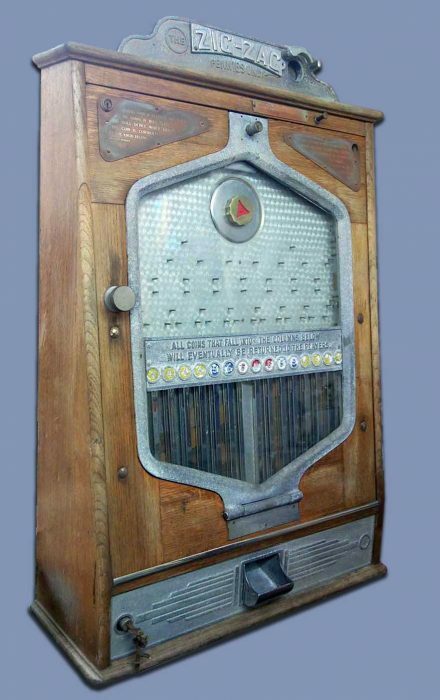 This upright bagatelle offers prolonged game play, the ball returning until it finds a target. The lower cup loses; the circles around it return the ball, and the upper circles and triangles win the coin back, with a turn of the handle. By changing the pay-slide the win cups could return slightly more than the original stake. One of several variations on the Challenger. In this instance, it's merely a name change, achieved by fastening the new name over the original casting. Built by Holte Manufacturing Co. for Bradley, this was a complete re-design of the long-lived Challenger. 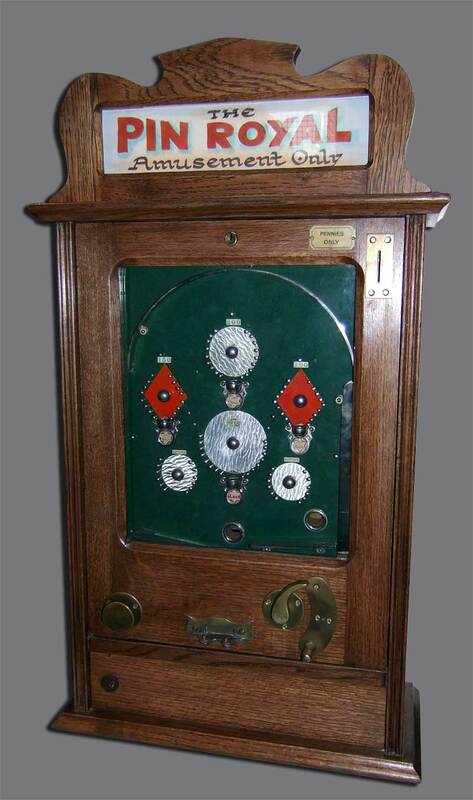 A smaller, lighter wall machine, it was cheaper to manufacture and addressed an issue with the original design which required the player to press the coin entry lever to trigger a payout. Super Challenger used the weight of the falling coin to automatically trip a payout. All except the central lose column paid 5 coins. Like the original, the game enjoyed considerable success. Most examples are finished in Formica. 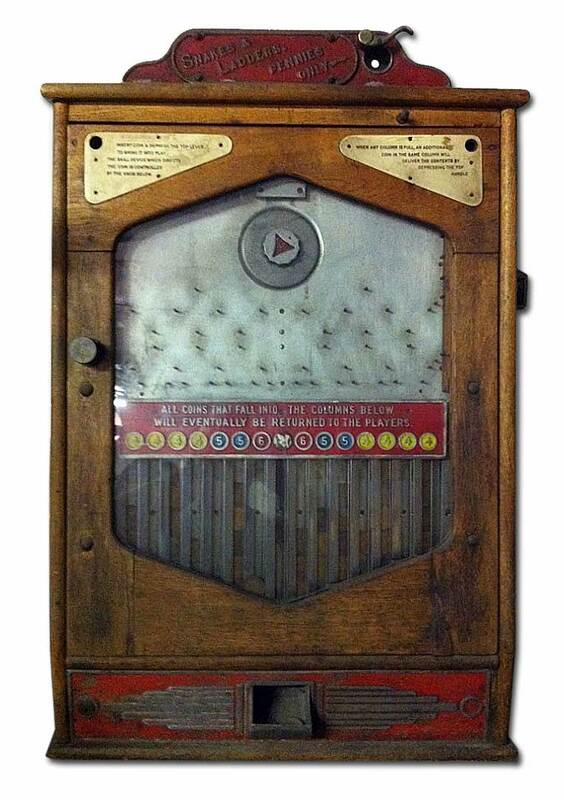 Unusual, Formica-clad wall machine. Players drop coins over the pirate galleon, aiming to tip a loaded plank by selecting one of four slots. 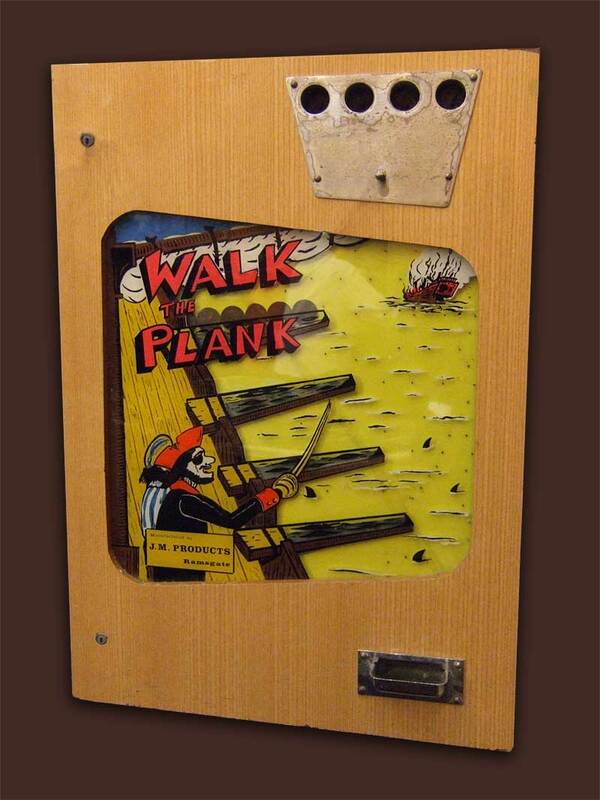 Coins bounce down over the pinned playfield and when an upper plank tips, coins roll off and spill to the ones below. In the ensuing cascade, excess coins fall to the payout cup. 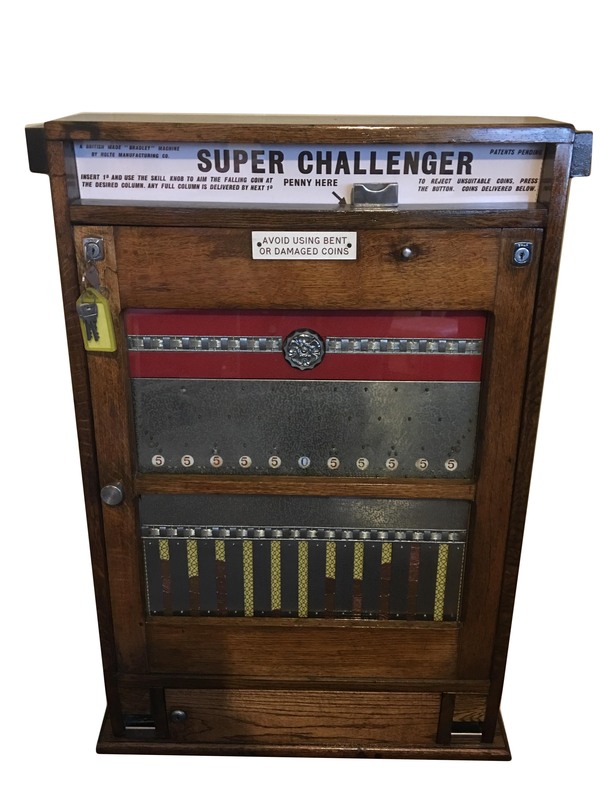 Another revamp of the Challenger wall machine, this one is notable for the cast frame around the playfield, which allowed the operator to deal with the inevitable coin jams without having to lift out the mechanism and remove panes of glass. This modification was later rechristened the Shooting Star, with a new set of Art Deco castings.